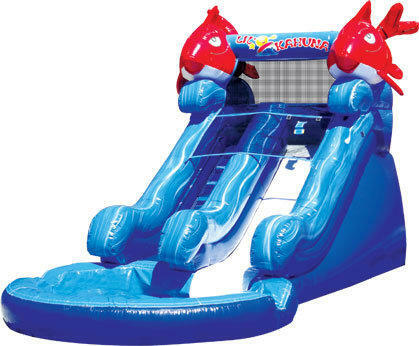 The 12' Tall Lil' Kahuna Water Slide - This Slide is perfect for your back yard party or events. Designed with the lil tikes in mind it is our shortest water slide we offer. Perfect for a daycare or pre-school. The Lil Kahuna has a splash pool at the bottom to keep you cool through out those HOT Summer days. Plan on booking early to make sure we have one available for your next BIG! event. Our water Slides are the most popular items during the Summer and tend to get reserved well in advance to book early.